Putting my calling in the context of my vocation and business along with what the Father is doing in nations has helped clarify my own story. Imagine coaching Paul; he wants to take the gospel to Rome knowing he will face confinement and loss of his head (before he writes much of the new testament while going blind in prison). Yet, its all worthwhile and part of His heart’s desire! Ditto for John the Baptist and the rest of the apostles. How does that fit our neat little concept inheriting our identity, dreams coming true and prosperity following us where ever we go? No wonder life can be a bit confusing! Our personal why is always in the context of a higher purpose. I don’t even have to survive to contribute my part. Even my own life is not just about me. I’m part of something(s) much bigger than myself. Here’s the drill. I want to understand my book and identity (Ps. 139:15-16). That’s wonderful. But the context is the book of my business and nation. What is the Father doing on those levels and what’s my role? When I understand calling in those terms, something exciting happens. . . HUMILITY! I’m not just mouthing a verse when I put the Kingdom first. I know the higher purpose in which I’m just one part. When this grasp of the context of my calling occurs there are several natural fruits: 1) I’m not necessarily discouraged by delays or setbacks, 2) I’m prepared emotionally for great acceleration and visibility when the time is right, 3) I see the value in others in my tribe and team, 4) I’m creating value and wealth as a spiritual part of my covenant blessing and a logical part of my work and business. I’m not waiting, I’m creating. I no longer view gains or losses in terms of my own identity and personal progress. I’m part of much larger warfare and victories. I’m a son with a seat in His council contending for things in heaven that don’t exist on earth yet. I’m bringing them back as exploits through warfare and faith and all kinds of complexities. It’s a pioneering, exciting, messy, confusing, glorious privilege. If my lens were my personal attributes or success, I would count it all as a failure. But I’m contending because I can see what the Father is doing and where we’re going. My imperfections and problems can’t keep my hand from going up when I hear, “Whom shall l send?” I’m a sufficient son because of Him. Kingdom is premised on volunteering beyond my ability, sufficiency, and provisions. Want to go with us to the next step? 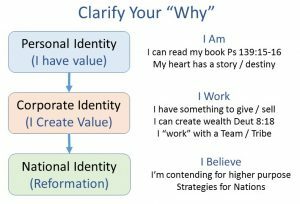 Personal Identity – We use a Heart Plan to help clarify personal calling by listening to your desires and what God wrote in your heart, “opening your book” (Ps 139:15-16) We’re integrating the courts of heaven to break off things that hold you back. We’re planning to make this available as an online course in the next few months, so it’s more affordable and accessible. In the meantime, we’re coaching and praying with individuals. Getting your heart plan in writing is a strategic step that bears great fruit in your heart, vocation, finances, and ministry. We’ve guided a long list of heroes into the fullness of their own story. Connecting with your heart feels like a jailbreak! 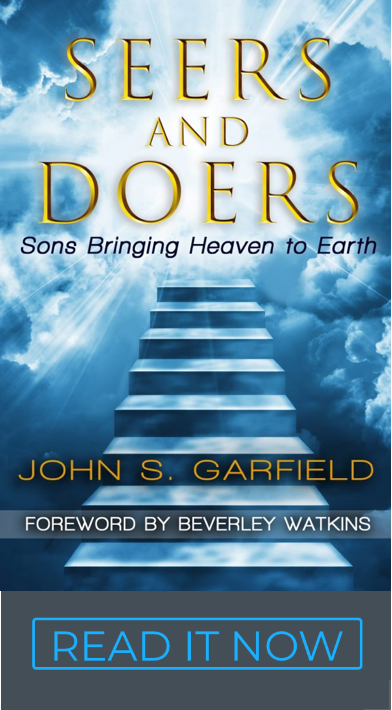 Your business – Like an individual, a business also had a book (a Kingdom purpose). It’s connected to the heart plan of the CEO and the company leadership. Corporate Heart Plans help businesses connect with their Kingdom purpose. We’ve also teamed up with Larry Nault to offer the specifics in “how to” Build a Kingdom Company. 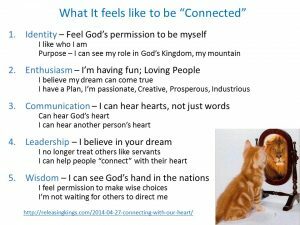 Many business people are being invited into their corporate Kingdom purpose right now. They don’t need to be convinced. They want to know how – we can help. You can find out more with Larry or John. Your Nation – In my travels to Europe, the Lord has opened a door in the spirit to understand the calling or book for nations. The book of the Netherlands is a great example that we’ve used in the Courts of Heaven to release the Father’s heart over the Dutch. It’s a powerful tool that resonates with God’s people. For those of you who own a Business, join Larry Nault and me at Building A Kingdom Company.